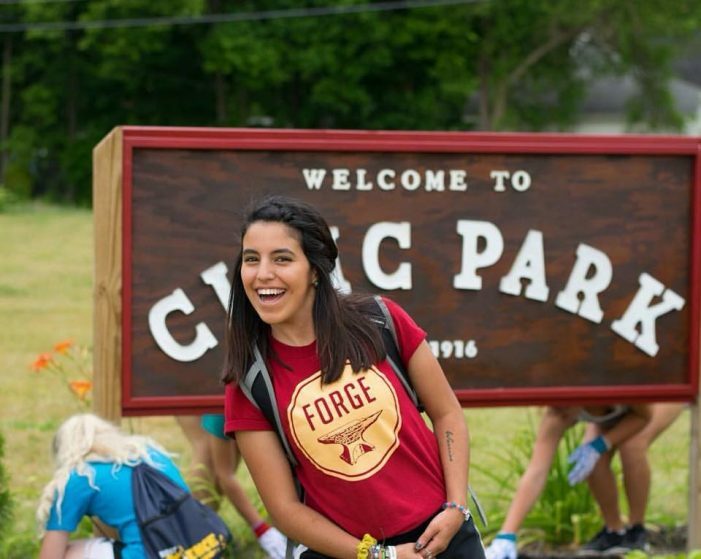 Lifting up neighbors, friends and visitors alike, the sounds of the Heritage & Harmony Festival are already drawing interest, attention and accolades on this, the first day of its 3-day run in Flint’s Historic Civic Park Neighborhood. Organizers feel that it is important to bring celebratory events like this back into Flint’s neighborhoods and are confident that this inaugural activity will be the first of many successful events to follow. The free event, which is open to the public, runs from noon until 8 p.m. daily. 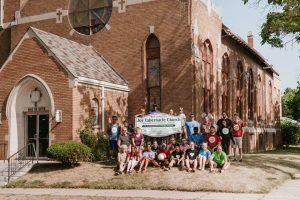 “There’s a bit of something for everyone here,” according to Maurice Davis, the head of the effort , the Civic Park Neighborhood Association and Second Ward councilman. The kids’ bounce house is one of the more popular attractions among the many games and activities available to area youth. The stage entertainment runs from 3 p.m. until 8 p.m. daily. 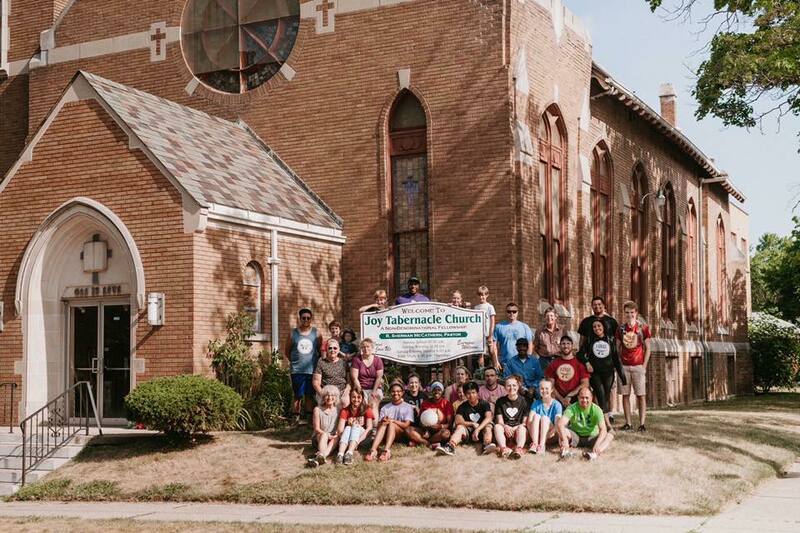 It’s gospel today, featuring the popular Joy Tabernacle Church Singers and Flint Triumph Praise Dancers, among others. Tomorrow’s line-up will feature jazz, followed by blues on Wednesday. Flint’s own party blues man Maurice Davis will take to the stage at 7 p.m. Wednesday preceding the fireworks display. Other musical artists include James Wood, Motown Imitators, FEE, Jerome Clark, High Definition, Twyla Songbird, Greg Ellis, Caster Fish, Nikel, and DJs Gardell Haralson and Walt Jones. 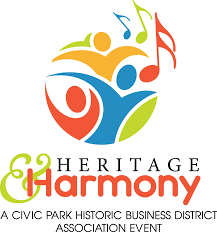 Organizers are hopeful that the Heritage & Harmony event will serve as a catalyst, fostering hope, promoting entrepreneurship and building community pride in the heart of Civic Park. The event is free. Food, beverages and other items for purchase will be made available by vendors. 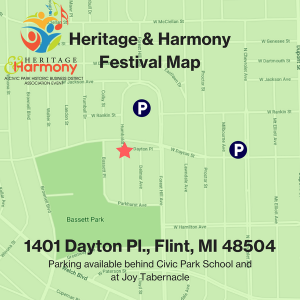 Parking is available behind the former Civic Park School and at Joy Tabernacle Church. 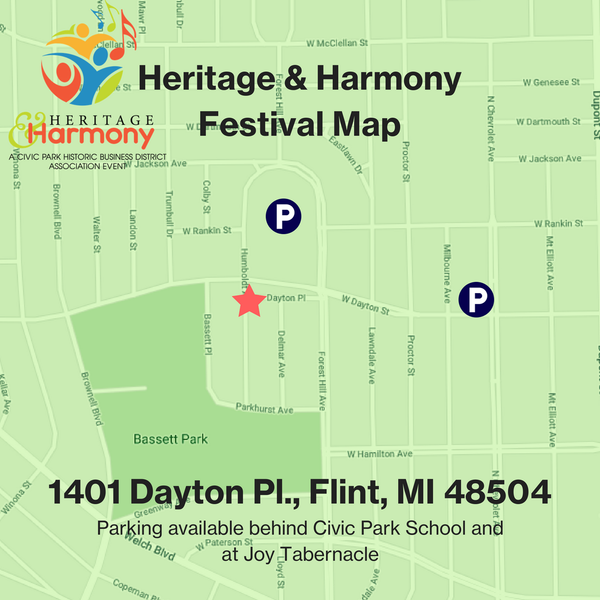 Editor’s Note: In addition to the Civic Park Historic Business District, the event is made possible with support from Genesee County Habitat for Humanity, AmeriCorps NCCC, City of Flint, Civic Park Neighborhood Association, Community Foundation of Greater Flint, Flint & Genesee Job Corps, Flint BRAND, Flint Neighborhoods United, Hamilton Community Health Network, Kettering University, Lawrence E. Moon Funeral Home, Messiah’s Management & Consulting Firm, Ruth Mott Foundation, Attorney Terry R. Bankert, TheHUB Flint, Urban Renaissance Center, and Walmart. 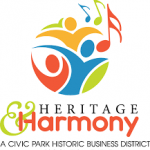 For more information and updates on the festival, visit the Heritage & Harmony Festival page on Facebook.